14 July 2016, Pasay City- The National Competitiveness Council has named the most competitive LGUs in the 4th Regional Competitiveness Summit today as it recognize the crucial role of local government units in promoting competitiveness in the country. The event highlights the results of the 2016 Cities and Municipalities Competitiveness Index (CMCI). Topping the list of overall most competitive Highly Urbanized Cities (HUC) is Quezon City followed by Makati City at 2nd and the City of Manila at 3rd place. Meanwhile, Naga City secured its position as the overall most competitive Component City, along with the second placer San Fernando City, Pampanga. Legazpi City, Albay landed in the 3rd spot. On the overall most competitive 1st-2nd Class Municipalities category, Cainta, Rizal is 1st place while its neighbor Taytay, Rizal moved one notch to 2nd place. Last year’s overall top municipality General Trias, Cavite slipped to 3rd rank. On the other hand, Infanta, Quezon emerged as the overall most competitive 3rd-6th Class Municipality, with Baler, Aurora in the 2nd notch, while Calamba, Misamis Occidental placed third. NCC also cited the most competitive provinces, led by the Rizal Province, which placed 6th last 2015, followed by Cavite, which also jumped from 9th spot in the previous year. South Cotabato moved one notch to 3rd place in this year’s rankings. 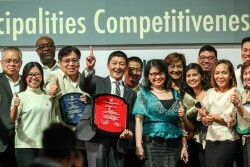 Under the Economic Dynamism Pillar for HUC, Makati City performed best followed by Pasig City and Quezon City. For the Component Cities, Naga City, Camarines Sur got 1st place, while Imus City and Biñan City trailed in 2nd and 3rd places, respectively. For 1st-2nd Class Municipalities, General Trias, Cavite topped the category with Cainta, Rizal in 2nd , and Sta. Maria, Bulacan in 3rd place. For 3rd-6th Class Municipalities, Jimenez, Misamis Occidental ranked first, followed by Manito, Albay and Nasipit, Agusan del Norte. On the Government Efficiency Pillar for HUC, City of Manila is the most competitive, with Quezon City as second and Iloilo City as third. For Component Cities, Cotabato City led the ranking followed by Naga City and Legazpi City. For 1st-2nd Class Municipalities, Cainta, Rizal ranked first, with Taytay, Rizal and Midsayap, North Cotabato next in the list. For 3rd-6th Class Municipalities, Calape, Bohol topped the category followed by Paoay and Pasuquin, both in Ilocos Norte. Lastly, under the Infrastructure Pillar for HUC, Quezon City is the best in the category, trailed by Makati City and Pasig City. For Component Cities, Naga City ranked first, while Bacoor City, Cavite and Legazpi City, Albay placed second and third places respectively. For 1st-2nd Class Municipalities, Cainta, Rizal is the most competitive, followed by Malay, Aklan, and Taytay, Rizal. For 3rd-6th Class Municipalities, Infanta, Quezon led the category, with Pagsanjan, Laguna and Baler, Aurora next in the list. Aside from these citations, NCC recognized the most improved LGUs from each category: Taguig City for HUC; Ormoc, Leyte for Component Cities; Pagbilao, Quezon for 1st-2nd Class Municipalities; and Barugo, Leyte for 3rd-6th Class Municipalities. This year’s CMCI has the largest number of participants, with 1,389 LGUs, 144 of which are cities and 1,245 are municipalities. This equals to about 85% of total LGUs in the Philippines. When CMCI started in 2013, only 285 or 17% of the LGUs in the country joined the index. The data used were gathered with the help of the 16 RCCs, which are composed of public and private sectors and the academe. CMCI measures LGU’s competitiveness based on the three pillars: Economic Dynamism, Government Efficiency, and Infrastructure. The increasing coverage of the index signified a higher level of interest and awareness on the importance of being measured based on the three pillars and a stronger commitment to improve LGU performance based on the resulting ranking. NCC believes that LGUs are the building blocks of national competitiveness, the reason it encouraged the creation of RCCs. These RCCs are tasked to regularly assess local competitiveness indicators, formulate programs to improve competitiveness, and engage in investment promotion activities to attract investors and create new jobs. 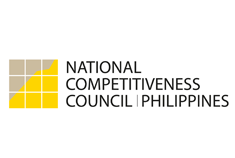 By developing competitive LGUs across the nation, NCC is optimistic that this would contribute to the overall attractiveness of the country as a preferred place to do business. Aside from the awarding, NCC also launched the 2016 CMCI website, which contains the detailed information on a particular LGU. The CMCI data may be used by businesses and government, as a tool for policy making, planning, governance, budget management, and investment promotion. Stakeholders coming from the national government agencies, business chambers, development partners, diplomatic community, and the academe have joined this annual event.